Walk into any Vegas or Atlantic City casino (or pretty much any casino in the United States) and you'll be hit by the sight and sound of row upon row of slot machines. Casinos fall over themselves to provide their visitors with the biggest, the brightest, the most generous slots, and then take their money, of course. But what if you live miles from the nearest casino in the US? What can you play online? Luckily, at today's biggest US Internet casinos you will find dozens of the best new online slot machine games, from classic Vegas-style slot machines to cutting-edge 3D games and slots offering the biggest progressive jackpots. Real-money slots online in the United States are so simple to play, it's no wonder they are popular with US gamblers everywhere. The idea of online slot machines is fairly easy to grasp. A slot will typically have 3 or 5 reels filled with symbols that will follow a particular theme (sci-fi, sport, ancient Egypt, etc). Select the number of paylines (i.e. different winning combinations of symbols across all the reels) and hit the 'Spin' button. It's that easy. There are thousands of USA online slots available in 2019, but no two are alike. That's what makes playing slots on the net so exciting and interesting. The Best Slots in the World - Online! Any land-based casino worth its weight in gold will feature some great slot machines, from the biggest progressive jackpot slots to the simple retro-style classic games taking up gaming space. What's great about US Internet casinos is that you will oftentimes find exactly the same games available online. There's very rarely much difference. The online slot machine reels are the same, the symbols are the same, and the bonus features are the same. It really is just like playing live, other than the cocktail waitresses hooking you up with free drinks, of course. The big change is that you will find RTP% (Return to Player percentages) much higher online than you find in a live casino. RTP is the amount, over the long term, paid back to players by the Internet casino for every dollar is bet. Where some live slots RTPs can be in the 80s, online you will find RTPs more in the 90s. You can find so many different kinds of online slots in 2019 that even the weariest USA players can find something they like. At a typical US online casino you can find a classic 3-reel game or two, like the Vegas slot machines of years gone by, slots with 243 "win all ways" paylines, or standard 15-40 payline games. You can find the latest big movie tie-ins with cutaway sequences from Hollywood blockbusters, and cutesy fairy tale-themed online slot machines with simple graphics. But possibly the best reason to play slots online in the USA is the many progressive jackpots on offer. Progressive jackpots take a percentage of every bet made and pay them out if you hit a certain winning combo or bonus feature. Record jackpots online have hit the $10 million mark, so these are certainly titles you need to hunt out at gaming sites. The mobile gaming revolution in 2019 means you can also play slot machines on your smartphone or tablet. These real money online slots have been specially altered to fit your touch screen and often have the same great graphics as their PC or Mac cousins. Finding great sites for real cash slots is easy. Just look at our top reviews to find yourself some good gaming casinos. Our comparisons and reviews show you where to find the biggest range of games anywhere on the net. 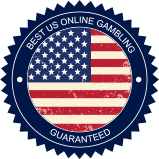 So, check our United States betting guide today and sign up to some top slots rooms for USA players. There you will find the best RTPs, the biggest cash jackpots, and even the most generous welcome bonuses for first deposits.